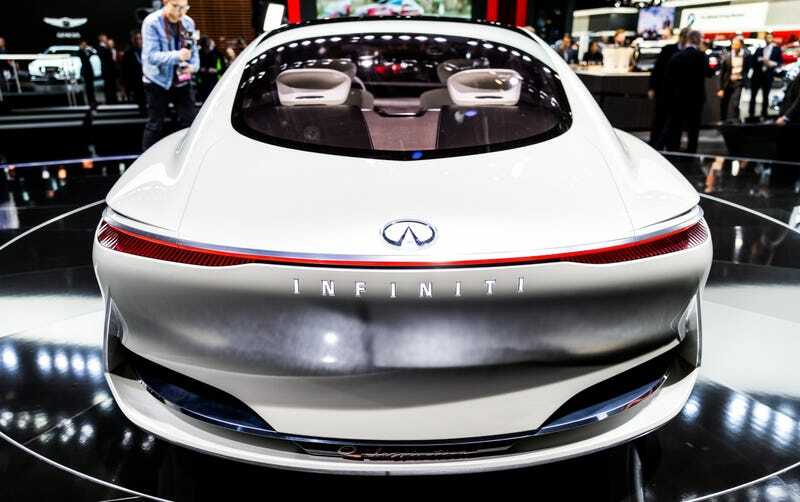 When Infiniti showed off the sleek Q Inspiration Concept at the Detroit Auto Show, it was actually moving under its own power thanks to the radical new variable compression engine. Evidently, however, that motor isn’t really the future of Infiniti, as Nissan’s CEO announced an aggressive plan to go pretty much all-electric and hybrid by just 2021. Infiniti’s often had trouble carving out an identity for itself in a crowded luxury car brand market, and it seems the way to do that next is to go electrified even quicker than some rivals. But where does it leave this trick engine they’ve been hyping up so much lately? The news comes from Nissan CEO Hiroto Saikawa himself at the Automotive News World Congress yesterday in Detroit, as reported by the eponymous publication. Saikawa said that “all new Infiniti models launched after 2021 will either be all-electric vehicles or will rely on the parent company’s new range-extending electric motor-powered technology called ePower,” the story said. EPower is an interesting format too, as it’s an electric powertrain that uses a small gasoline three-cylinder engine purely to recharge the batteries. It doesn’t drive the wheels at all, so think of it as a BMW i3 or Chevrolet Volt but a step further. At any rate, Saikawa predicted that half of Infiniti’s sales by 2025 will be electric or ePower cars. Again, this makes us wonder where it leaves Infiniti’s new VC-Turbo engine, the world’s first ever production-ready variable compression-ratio engine. We’ve called this the “Jesus engine,” because this elusive technology allows a huge variance between low and high compression to achieve diesel-like fuel economy and torque while running on gasoline. Read our own David Tracy’s detailed writeup here. It’s one of the technologies projected to give the internal combustion engine a few more years or decades of relevance before the inevitable move toward total electrification. Maybe that’s happening sooner than expected here! One company source said it is possible that the four-cylinder VC Turbo might power the big QX80 after that time. The QX80 currently is powered by a 5.6-liter V-8. A company spokesman declined to comment on future plans for the QX80. The VC-T goes on sale in the new QX50 crossover, available later this year, so perhaps it will only have a shelf life of a few years. Or, hopefully, the VC-T will simply find use on a variety of Nissan vehicles instead. That makes sense, but it’s odd since the engine was so heavily billed as an Infiniti thing until now. Anyway, interesting moves by this manufacturer, but I do hope the VC-T doesn’t end up a totally abandoned experiment.